The structure of the Bachelor in Forestry Science degree offers exciting opportunities for study in a range of disciplines. The degree is management oriented and requires some study of science, commerce, engineering and sociology subjects. It is an exciting time to be working in Forestry and related industries. Because of past silvicultural practices, the annual harvest of plantation pine is increasing substantially year on year, and is expected to double over the next 20 years. The first year is mainly concerned, however, with the basic sciences that underpin all thinking on forest management and resource utilisation. (First year forestry students are not in fact committed to a forestry degree as almost all their credits can be transferred to a BSc or a BCom). This first year may be taken at any New Zealand university - a table of equivalent courses is shown below. However, the FORE 100-series of subjects are compulsory papers in the first year and the equivalent extramural paper must be taken by students at other New Zealand universities. You have the choice of semester with FORE 102 - Forests and Societies. In subsequent years this basic knowledge is applied to the forest situation. A feature of the BForSc curriculum is that, from the third year on, students may take an optional course from another Faculty schedule. This allows students to develop a "minor" in another discipline, such as economics, biology, geography etc., within the forestry degree. While some specialisation is encouraged, all students will have a broad competence, allowing them to work in any field in forestry, and in other areas of land resource management. There is no restriction on the numbers entering degree studies. Ideal NCEA Level 3 preparation for a Forestry degree would include subjects such as Biology, Chemistry, Mathematics (with statistics and probability), Economics and English. Entry to Year 1 at UC is normally from Year 13 (NCEA Level 3). Direct Entry to Year 3 may be from a completed BSc or other degrees with passes in suitable subjects. Students with a completed NZ National Diploma in Forestry qualification may be granted a special course of study in recognition of their previous training. Students who decide to transfer to a BForSc after completing one year or more of another degree should have a minimum of 120 points including passes in Chemistry, Biology and Statistics. It may be possible to proceed if one of these subjects has not been taken, provided that a good grade average has been achieved overall. Again, students should write to the Dean of Engineering and Forestry in the first instance. Sponsorship, if sought and where relevant, may be available through the Ministry of Maori Development or private forestry companies. Entry to the School of Forestry is not determined by sponsorship, however, and only a small proportion of all students are sponsored. course of study totalling 85 points. Note: Students who do not complete their first year at UC will normally take FORE141 in Year 2 at UC. Intending students should follow the UC application and enrolment process, and should pre-enrol for the subjects shown below. Applicants who undertake their first year at other universities should communicate with the School of Forestry before the end of January (earlier if possible) in the year in which they intend to commence, so that an appropriate set of papers may be agreed on before enrolment. Equivalent or acceptable papers at these other institutions are listed in the table below. 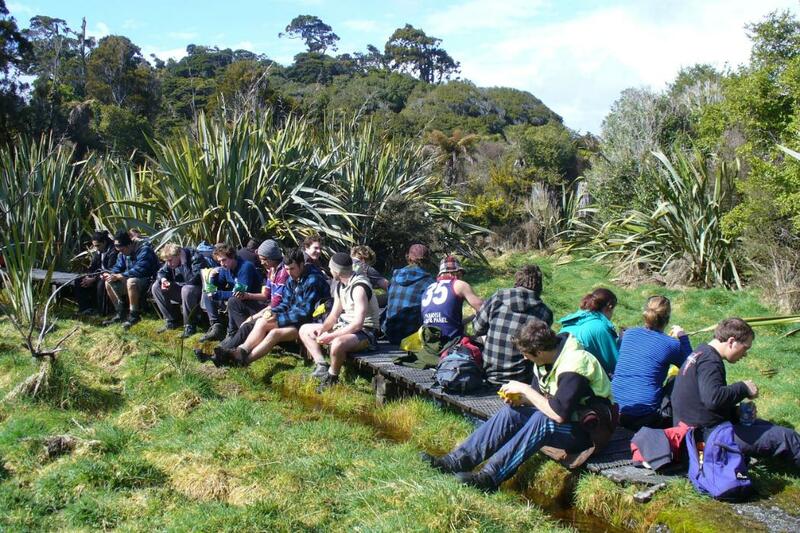 Field trips and practical courses are an integral and compulsory part of the forestry degree and attendance and participation in all field trips is required before the degree can be awarded. Final confirmation of venues and dates will provided at the commencement of lectures in 1st Semester. Students should ensure they block out the dates appropriate to their year of study as soon as possible to avoid missing the field trips. All students are required to present a current First Aid Certificate during their study. Details of First Aid requirements are available on Learn. As part of the degree, all students are required to gain 90 days practical work experience in forestry, conservation or the forest industry during summer vacations. Students should obtain written confirmation from their employers of the period of employment and the type of work undertaken. Students are also required to provide reports to the School on their work. The School's coordinator for vacation work is Professor Manley. International students seeking employment, either part-time or during vacation periods whilst they are studying, are advised to check the restrictions included on their Student Visas. The Department of Immigration places very strict limits on employment hours, ranging from not being able to work to a maximum hours per week limit. It is the students' responsibility to be aware of their options before seeking work, or assistance with finding work. The School does not guarantee employment for International Students. For those students with a desire to combine studies in Forestry with studies in Commerce or Science, a concurrent degree programme is possible. Under this programme, it is possible for a student to graduate with two degrees in a much shorter time compared to doing the degrees separately. For example, it is possible to complete the Bachelor of Forestry Science and a Bachelor of Commerce in five years. Students interested in the concurrent degree programme should contact the Dean of Engineering and Forestry. It is possible to complete a BCom degree with a substantial number of Forestry courses in three years in the areas of accountancy, finance, marketing, strategic management and production management. The BE (Hons) in Forestry is a UC engineering degree with courses from the School of Forestry, Civil & Natural Resources Engineering and Mathematics & Statistics Departments - all within the College of Engineering. Timberlands, on behalf of Kaingaroa Timberlands, wants to encourage students to take up study towards a qualification in the forestry industry, as there are many interesting and varied jobs available to graduates and great long term career prospects within the industry. Timberlands recognise it is a big hurdle for many prospective students to begin tertiary study, often due to the financial cost, and want to make this easier by offering financial assistance through this scholarship.The scholarship supports tuition fees for up to four years study. Further information on the application process and award can be found on Timberlands employment site. $300, plus 1-year Associate Membership to NZIF. No application – awarded by the School of Forestry to the best all-round student in the 4th Forestry Examination. $300. No application – awarded annually by the School of Forestry to the student whose dissertation in FORE 414 is judged to be the most innovative. Book prize, No application – awarded annually by School of Forestry to the top student in FORE 307 – Plantation Silviculture. It is an exciting time to be working in Forestry and related industries. Because of past silvicultural practices, the annual harvest of plantation pine is now taking a permanent step change from about 20 million cubic metres to 40 million cubic metres over the next 20 years. In some regions, notably the East Coast and Northland, the big change is already well under way now. Where do Forestry students go? Our graduates enter every aspect of forestry and resource management you can imagine, and probably a few others that would surprise you. Graduates can find themselves working for Forestry Consulting companies; forestry management companies such as Rayonier or Timberlands; regional, environmental or local councils, Government departments such as MAF Policy; and increasingly for forestry businesses overseas. Australian companies have been regular recruiters of our graduates in recent years. Salary packages can sometimes include vehicles, cellphones and other incentives depending on the role you undertake and your location. Starting salaries after four years study are now in the range of $41,000-$52,000. The challenges are immense: what new markets can be found for the wood, what innovative new products can be developed, how can the increased flow of wood be managed without unacceptable pressure on the environment, what social and political issues will arise, and how can they be managed responsibly? These are very significant challenges, and only highly qualified, knowledgeable professionals will be able to handle them successfully. Many of them will be professional foresters, graduates of the School of Forestry, the only place in New Zealand where a comprehensive degree in professional forestry is offered. an understanding of the responsibility of professional foresters to conduct themselves in an ethical manner. Career prospects for students with forestry degrees obtained in New Zealand are excellent, both domestically and internationally. Students at the School of Forestry gain a wide range of skills that equip them to work in many different kinds of forest ecosystems with a variety of management or conservation objectives. UC houses New Zealand's only professional forestry school, dedicated to excellence in forest research and education. If you are interested in a forestry career then you should enrol at Canterbury. The School of Forestry provides a focused forestry programme that is relevant to employers. We know this because the employers tell us so - our students are sought not only by New Zealand forestry organisations but also internationally. The shortage of forestry graduates in Australia means that Canterbury students who have completed studies over the past five years and more have been recruited by forestry companies in Queensland, New South Wales, Victoria, South Australia and Western Australia. However, because of opportunities in New Zealand, most stay here. We are seeing an increasing awareness in New Zealand and elsewhere of the diverse roles that forests play. Forests have long been seen as important for the New Zealand economy - forest products make up 10% of total exports. However, forests are now being seen as important because of their environmental and social benefits. Carbon sequestration, erosion reduction, water quality improvement and better biodiversity outcomes are some of the environmental benefits from forests. For example, the Emissions Trading Scheme recently announced by the Government has carbon sequestration by plantations as its centrepiece. These developments create additional research opportunities for undergraduate and postgraduate students, as well as employment prospects for our graduates. It is an exciting time to be doing a degree at the New Zealand School of Forestry. Our students have an opportunity to go on exchange programmes to North America to study forestry at the University of British Columbia in Vancouver, BC, Canada, and Virginia Polytech and State University, in Blacksburg, Virginia, USA. The exchanges are available to School of Forestry third-year students who will enrol at UC and complete course work at either UC or the North American university, or one semester at each. Students can travel to North America in one or both semesters. Enrolment at UC through the period of the exchange covers all tuition fees and no additional tuition is paid to the North American school. Personal medical insurance must be purchased as a requirement of the exchange. This is available from a variety of vendors in New Zealand. Exchange students typically stay in North America for six months to a year and take a combination of required papers and electives that complement the BForSc. The two schools, Virginia Polytech and State University (Virginia Tech) and UBC are both strong world-class, forestry schools with excellent programmes of study. Virginia Tech is particularly strong in GIS and plantation forestry. It is located in the southeastern United States where the most intensive modern plantation forestry is being conducted. International Paper (a 51% shareholder/owner of Carter Holt Harvey), Rayonier and Weyerhauser are all important forest companies in the region and offer opportunities for short term employment that can enhance a student's competitiveness for forestry jobs back in New Zealand. Virginia Tech is located in Blue Ridge Mountain country with its large wilderness areas such as the Great Smoky Mountains, the centre of ecological and forest biodiversity for the eastern half of North America. UBC has a large forestry programme with real strengths in wood processing and forest harvesting, two areas of great significance in the New Zealand forestry sector. UBC also has strong programmes in natural or wild forests with great depth in ecology. Fletchers is one of the most important forestry corporations in the region and internships conducted in British Columbia would very likely enhance job prospects in the forestry sector here in New Zealand. Students may also apply to participate in university-wide exchange agreements with several other schools with formal exchange agreements with Canterbury. Applications for exchanges to UBC close on 1 February each year. Applications for exchanges to Virginia Tech close on 1 July each year. Students should submit an application to the International Mobility Coordinator, Student Services Centre (see Exchange Students website for contact details). Candidates would be notified of their success and subsequently agree on the course of study. A brief essay (1-2 pages) relating your interests in forestry and the exchange programme. Personal experience that you think has helped prepare you for forestry or has fuelled your interest in an international exchange. (Tell us anything about yourself that you think makes you a good candidate for the exchange). What would you like to be doing in 5 years time? Attach a brief resume that includes your education; any scholarships, awards or honours; employment experience; volunteer experience; field skills etc. Provide the name and phone or e-mail of one faculty member who might be contacted as a reference.